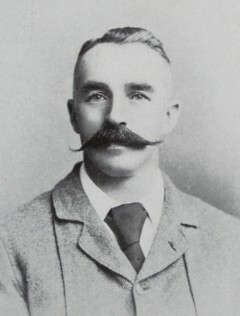 Born: March 1854, Elland, Yorkshire, England. Died: 26 May 1924, Johannesburg, South Africa. Edward Farrar, son of Joseph Farrar, a card manufacturer and mill owner, was educated at Brook's Bank Grammar School in Elland and the Huddersfield Mechanics' Institute. Subsequently he trained as an engineer in his father's business and with S.S. Stott and Company of Haslingdon, Lancashire. After completing his appreticeship he was employed as chief draughtsman at Hodge & Sons, engineers and boilermakers of London, for eleven years. In 1889 he joined the Hopcraft Furnace Company of London as chief engineer for a year and in 1890 came to the Natal Colony to be employed in an engineering business in Durban. In 1895 he was appointed chief draughtsman to the Consolidated Investment Company in Johannesburg, under the consulting engineer C.T. Roberts*. A year later he became mechanical engineer to the Klerksdorp Proprietary Mines, under the management of G.A. Denny*. Next he was appointed mechanical engineer at the Aurora West United Gold Mining Company, where he designed and supervised the construction of the plant. In 1899 he became chief mechanical engineer to the General Mining and Finance Corporation, a position he still held in 1905. Farrar became a member of the Mechanical Engineers' Association of the Witwatersrand in 1898, in its first year, and served as joint vice-president from 1903 to 1905. He was then elected president of its successor, the Transvaal Institute of Mechanical Engineers, for the year 1905/6 and thereafter served on its council ex officio as a past president. With W.M. Epton* he read a major paper before its members on "Wire ropes used for winding: their strength and some causes of its reduction" (Journal of the Mechanical Engineers' Association of the Witwatersrand, 1904/5, Vol. 3). The paper gave rise to extensive discussions. By 1905 Farrar was a member of the Patents Committee and of the Standardisation Committee of the Witwatersrand Chamber of Mines. He joined the South African Association for the Advancement of Science in 1905 and was still a member in 1918. In 1905 he also became a member of the British Association for the Advancement of Science when it held its annual meeting in South Africa. Farrar was married to Betsy Isabel Farrar, born Burley, with whom he had a son and two daughters. Men of the times: Pioneers of the Transvaal and glimpses of South Africa. Johannesburg: Transvaal Publishin Co., 1905. National Archives Repository (TAB), Source MHG, Vol. 0, Ref. 54113: Death notice, Edward Farrar. Orr, J. Presidential address. Associated Scientific and Technical Societies of South Africa, Annual Proceedings, 1938, pp. 15-86 (see pp. 21 and 23).